What is going on in North Lake Tahoe? This laid back rural community – far different from the hustle and bustle of South Lake Tahoe – has something for everyone but with a calm ambiance. 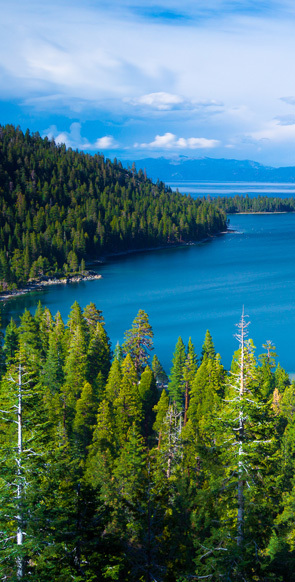 The north shore of Lake Tahoe has always been more of a place to take a quiet vacation rather than party around the clock. The north shore of Lake Tahoe is just 33 miles from Reno, NV, and the Reno-Tahoe International Airport. Incline Village, the largest town in North Lake Tahoe is 29 miles to the north of South Lake Tahoe, CA, and Stateline, NV, if drivers head up State 28, on the eastern side of the lake. From the 3 Peaks Resort and Beach Club, it's a short, relaxing drive. What makes Incline Village stand out a bit from other towns around the lake is its concentration of innovative, high-tech and Internet oriented businesses. Evidently, business people have seen the advantage of living in rural comfort and relative seclusion while instantaneously communicating with their clientele world wide. So, if you are the CEO of a successful business on the Information Highway, you might want to think "real estate" when visiting this end of Lake Tahoe. If not, well, there's plenty to do in town and everything from water sports, mountain trails for hiking and biking, to nearby winter resorts with every conceivable alpine activity available. There are a number of casinos on the Nevada side of Lake Tahoe's north shore. For instance, the Hyatt Regency Lake Tahoe Resort, Spa, and Casino. And as with many bars, clubs, hotels, and restaurants, in Nevada, Cosby's Grill – Pub – Casino encourages barflies and gourmets alike to exercise the one armed bandits between rounds or courses. A few miles down State 28 in Crystal Bay, sort of midway between Incline Village and Kings Beach, CA, the Tahoe Biltmore has a nightclub on site, Breeze, that features DJ's, Karaoke, shows, and the occasional sporting event. The Crystal Bay Club, renovated in 2003, features elegant comfort, HD TV everywhere, and individually tailored ambiance. Perhaps the most famous, some would say notorious, of the north shore casinos is The Cal Neva Resort in Incline Village at Crystal Bay. Cal Neva started out life in 1926, as the first casino-hotel on the lake. Over the years, including the period of Frank Sinatra's ownership, the resort had its ups and downs. Today, under new ownership, the casino remains an interesting bit of history well worth a look-see by travelers.